I was given a sample of KeVita’s Mango Coconut Probiotic drink at the Natural Products Expo West and have become a real fan. I really enjoy the subtle fruit flavor of the drink and the yogurt essence that the probiotics and fermentation give it. Since the drink is fermented it has a slight bubble to it, but not nearly as violent as the carbonation in soda. Our first three flavors are certified organic, the coconut flavors are certified as made with organic ingredients, which means they are made with at least 70% organic ingredients. We use certified organic cold plant extracts, sweeteners, fruit purees, flavors and Certified Organic KeVita™ Culture. 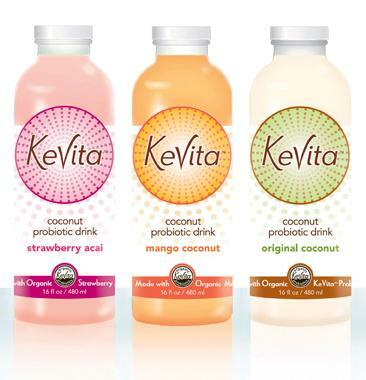 KeVita™ is an organic probiotic superdrink. KeVita™ is made using a fresh new approach. Water or tea is combined with Certified Organic KeVita™ culture, a blend of beneficial bacteria, healthy yeast cultures and a small amount of organic cane juice. KeVita™ contains a highly absorbable strain of probiotics originating from kefir derived cultures. For thousands of years these cultures have been cherished for supporting beneficial digestive flora. dairy, gluten and soy free. KeVita™ contains active cultures so keep refrigerated until ready to enjoy! I have not tried their first three flavors (Lemon Ginger, Living Greens, and Green Tea), but have heard great reviews about those flavors as well. I would definitely suggest giving these drinks a try…especially if you are a soda addict since this is a MUCH healthier alternative. For more facts about KeVita click here. I love KeVita I tried the living greens one it tasted awesome not as harsh and vinegary as kombucha! Interesting! I’ve never had it before. I am very curious to try it. Another positive about this drink (other than the health benefits and flavor) is that it comes in an awesome glass bottle which I have been reusing like crazy! we’ve been giving KeVita away in our Rejuvenation cleanse as probiotic snacks or as bases for our smoothies for the past few months. We really love it and think it’s above and beyond the other products out there! You can find it at whole foods…almost everywhere now! (I’ve found it in NYC, Washington DC and most recently the outskirts of Miami!!) Really great to reduce late night cravings, too! I’ve just been drinking it straight…I love the idea of using it as a base for smoothies! Hello from KeVita! We are so glad you found our delicious probiotic drink! Thanks for the great review!! I see Kevita is all over the blogs. Paid product placement? Flavor of the month? Other than the viral marketing provided by the company making this – what proof is there that this works in any way to aid digestion/health? Hi there! My recommendation for KeVita is based on my enjoyment of the product (I wasn’t sent free samples…I bought them myself at the store). I will have Chakra Earthsong (the founder of KeVita) answer your question regarding the proof about the health benefits. We have noticed people talking about KeVita everywhere too and we are so grateful! No product placement needed when you have fans like ours!! We are glad that people are finding and enjoying KeVita as much as we do! If you would like to learn more about KeVita’s health benefits feel free to check out http://www.KeVita.com/faq or you can email customerservice@kevita.com and ask to speak with our formulator. Thanks again VeggieGrettie for your wonderful post! Hi, my apologies for a delayed response, we have been in the middle of our largest production run to date, all hands on deck so to speak! KeVita is a sparkling delicious refreshment primarily for your drinking pleasure. At times people write in telling stories of improved digestion/elimination, indigestion, acid reflux or anxiety calmed, we are always pleased and at times surprised by the comments. We know people are having a great experience with KeVita, clinical studies show the active probiotic cultures in KeVita promote digestive health, maintain the immune system and deliver more active cultures than yogurt. I have heard of this happening with Kombucha. My only guess is that they might consider it a fermented beverage and categorize it with alcoholic beverages, but obviously there is a big difference between KeVita and an alcoholic drink. I really like KeVita coconut water. I have MS & it makes me feel better. I need to know where I can buy it. Maine markets have run out of it. How great that the Kevita helps you with your symptoms. I will put you in touch with KeVita so you can find out where to buy more. great! please KeVita, I’ll be so happy if you can put me in touch with them. thank-you so very much. I love this stuff, absolutely helps with my digestion! Big time!! 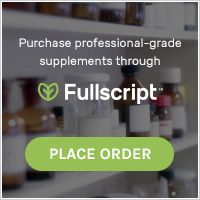 I have changed my diet recently to a mostly vegetarian routine, and it has taken my body/metabolism a while to adjust – this is the ONLY thing I have found that helps. The taste isn’t fantastic, but you have a great product overall. What about the stuff floating around in the Coconut flavor? Is that normal? I have seen stuff floating around in mine too and it has been fine, but if you have any doubt I would recommend calling KeVita…they are very responsive and I am sure they would be more than happy to answer your questions. Better safe than sorry. I tried it; tasted like vinegary bacteria…so disgusting. Plus it makes your hands smell BAD. I think this is the type of drink everyone drinks only because of what the label says, not because of any affinity for the taste. I feel that way about a lot of the kombucha drinks I have tried, but I actually really like KeVita and buy them all the time. I have a feeling these types of drinks are very polarizing. Either you like them or REALLY don’t. I had two at work ,seemed a bit bitter and subtle flavor . If you need a watered down drink with minimal vitamin / mineral content this is for you . The taste is like an empty juice bottle rinsed with cold bottles water , very diluted . How should I drink my Kevita? Should I drink the whole bottle at one time, or a little at a time? I don’t know. I would think that it is totally up to you. Sometimes I drink mine all at once and other times I nurse it throughout the day (but keep it in the fridge when I am not drinking it). Well I really wanted to like this and when I tasted it I did BUT I am allergic to Stevia and they use it as a sweetener so I can’t drink it anymore. In fact, people who suffer with ragweed allergies should avoid Stevia…it took me a while to realize that was what caused me to sneeze and itch and wheeze. This goddamned product actually EXPLODED all over my dining room. Glass was everywhere. They do not tell you this.